A compressor reed valve failure is a common complaint sent in by people that have an air compressor that continues to run, but that will not build air pressure. Here is what you can do about that. 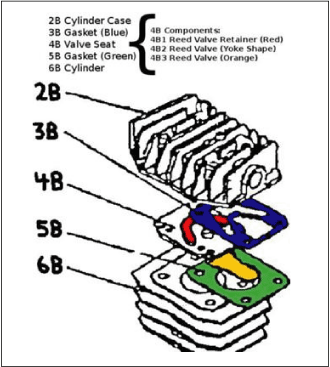 On behalf of all of us, our thanks to Jason Antonacci of North Augusta, SC for sending in a post and a diagram along with it, addressing the issue of air compressor reed valve failure. The diagram (shown below) is from the manual for Jason’s compressor. The concept will apply to any compressor that uses some sort of reed valve setup for intake and high pressure air compressor valves. Here is Jason’s drawing, his questions, and my response. I have an air compressor that recently stopped building pressure beyond 40 psi. After reviewing your troubleshooting steps and documentation I had hope that the compressor could be rehabilitated. Thank you for your site, it has been an invaluable resource. On disassembly I discovered the top, yoke shaped reed had failed: snapping in the middle. The bottom, tongue shaped reed is OK. If I can locate reasonably priced replacement parts, I’ll rebuild. This brings me to my question. All gaskets appear to be a fibrous material (cardboard?) sandwiched between adhesive material. Not all of the gasket came off cleanly, so bits are stuck here and there on both surfaces. What is the suggested method for re-finishing these surfaces for a new gasket? I was thinking a wire brush attachment on my drill. Do I need to be concerned about debris in the cylinder and if so how can I prevent/remove it? Lastly, what kind of lubrication? Apparently this reed valve design is prone to failure based on the number of similar complaints. Maybe I’ll build a Franken-compressor, mounting the 5hp motor w/ a belt driven compressor of another make? I responded: Thank you both for the compliment on my website, and for the photo / sketch of your compressor head. Reed valve failure is a common complaint for many of the lower cost, DIY type air compressors on the market. I would be hesitant about wire brushing the surfaces due to the potential for damage to the metal, and consequential difficulties in re-sealing. If you proceed in so doing, work slowly and carefully so that the metal isn’t scratched. Consider using a liquid/cream cleaner like “Goo Gone”, or similar, that will dissolve adhesives and sealants. Read the directions and use with care, please. I would very much be concerned about getting debris into the cylinder. Before you cover it with clear plastic or the like, and / or before you reassembled, blow it out with compressed air (difficult when your compressor is disassembled, I know) to ensure that there is no debris in there to possibly scratch the cylinder surface or damage the seals. Others have manufactured their own compressor reed valves out of paint scraper blades. See the sitemap page for a link to those directions. Thank you again for a very good post, and I shall use it to help other visitors that visit this website. Do you have a question about Reed Valve Failure? Please add your question here, and be sure to upload photos as they almost always help others help you with your compressor issue.